Stop by the CUESA Classroom for a cooking demo featuring the seasonal bounty of the Ferry Plaza Farmers Market. This demo will highlight a farmer-chef relationship forged and sustained at the farmers market, featuring Devil’s Gulch Ranch. Chef Greg Lutes opened 3rd Cousin in late 2015 with the support of the loyal community he built through his award- winning Kinfolk pop-up series. Lutes presents his rustic yet elegant take on California cuisine from the open kitchen of his 40-seat debut restaurant, creating a cozy atmosphere that makes you feel like a treasured guest at a friend’s dinner party. Lutes fell in love with cooking at a young age in his 350-person farm community of Malden, Illinois, and was quickly on a fast track that would take him to the kitchens of some of the top restaurants in the country. Following a stint under renowned French Chef Jean Joho at Chicago’s Everest, Lutes garnered accolades as Executive Chef at Michelin-recognized Courtight’s and at Les Deux Autres, named one of the best new restaurants of the year by Chicago Magazine. Lutes spent time under Chef Daniel Boulud at his New York restaurant, Daniel, before holding the Executive Chef role at Waterfront, Skates on the Bay, and Lot 7 in San Francisco. In 2013, Lutes branched out on his own with his Kinfolk pop-ups, which served as the inspiration for 3rd Cousin. With dishes that fuse familiar favorites with unexpected, fresh flavors, Lutes is one of the chefs quietly turning Bernal Heights into the hottest culinary scene in the Bay Area. 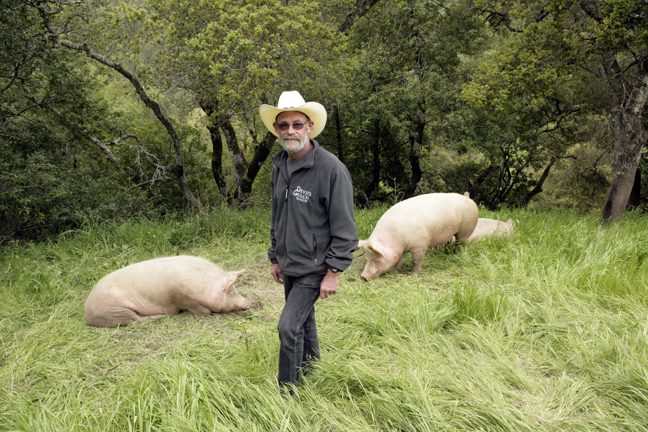 Devil’s Gulch Ranch is a diversified family farm in Marin County. In 1971, Mark acquired a few acres of land in Nicasio that had previously been used for dairy cattle and started raising horses and pigs. Today, Mark and his wife, Myriam, who is also a veterinarian, raise pastured pork, grass-fed lamb, and rabbit, in addition to growing wine grapes and asparagus.